The $629 16-300mm f/3.5-6.3 Di II VC PZD Macro is an affordable superzoom for Nikon’s DX lens mount. That means it designed specifically for use on Nikon DSLRs featuring an APS-C sensor, such as the D7100, D5300, and D3200, but isn’t compatible with full-frame Nikon DSLRs such as the D750, due to the smaller image circle this lens produces. Superzooms offer an incredibly versatile focal range, from wide-angle through to super telephoto. Taking into account the Nikon 1.5x APS-C “crop factor,” the 16-300mm f/3.5-6.3 Di II VC PZD Macro offers an equivalent 24-450mm focal length. That makes it a good choice for photographers who want to shoot a range of subjects, from architecture to sports, without having to continually switch lenses. The downside of such superzoom lenses, however, is that they can only offer a “slow” variable maximum aperture to ensure they are both affordable and relatively lightweight. That means the maximum aperture, or maximum amount of light that passes through the lens to the sensor, reduces as you zoom in. At 300mm, for example, this lens’s maximum aperture of f/6.3 lets in around 1.5 stops’ less light than at 16mm f/3.5. The maximum aperture ultimately has an impact on the shutter speeds you can use for an accurate exposure, so if you’re planning to shoot sports or wildlife, for example, where long focal lengths and fast shutter speeds are essential, then you’re going to need very good light to use this lens. 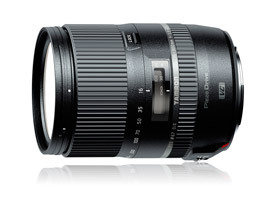 That said, the 16-300mm f/3.5-6.3 Di II VC PZD Macro does feature Tamron’s lens-based Vibration Compensation (VC) image stabilization technology, which enables the use of slower shutter speeds at the telephoto end of the zoom without images suffering from the effects of camera shake. The VC system will have no bearing on subject movement, however, so it really only comes into its own when shooting relatively static subjects. The 16-300mm f/3.5-6.3 Di II VC PZD Macro is also equipped with Tamron’s Piezo Drive (PZD) autofocus motor that promises quick and quiet autofocus performance, together with full-time Manual focus override, which allows photographers to quickly switch between manual and autofocus without damaging the autofocus motor. 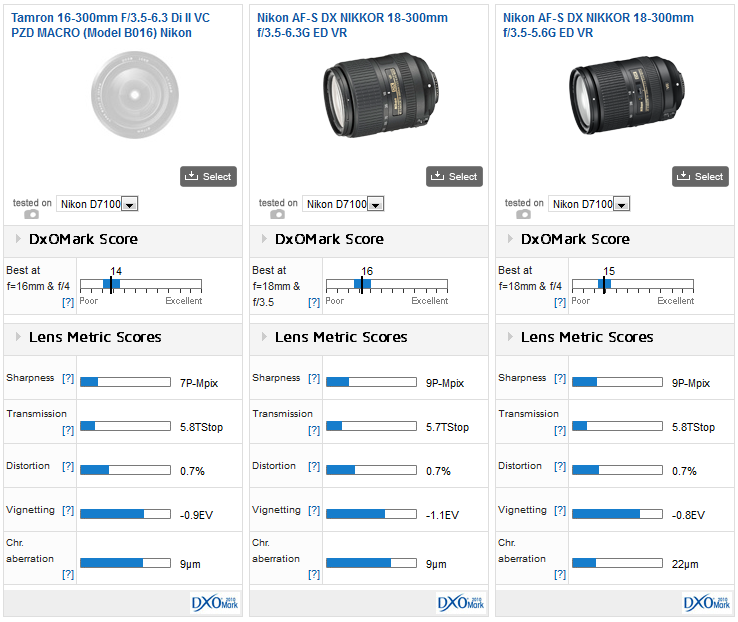 Tested on Nikon’s flagship APS-C DSLR, the D7100, the Tamron 16-300mm f/3.5-6.3 Di II VC PZD Macro achieves a DxOMark Lens Score of 14, with the best results at 16mm f/4. While this is towards the lower end of the performance spectrum, with the best-performing DX prime lenses scoring into the mid-to-high 20’s, it’s representative of the optical challenges of manufacturing a zoom lens that covers such a wide range of focal lengths. 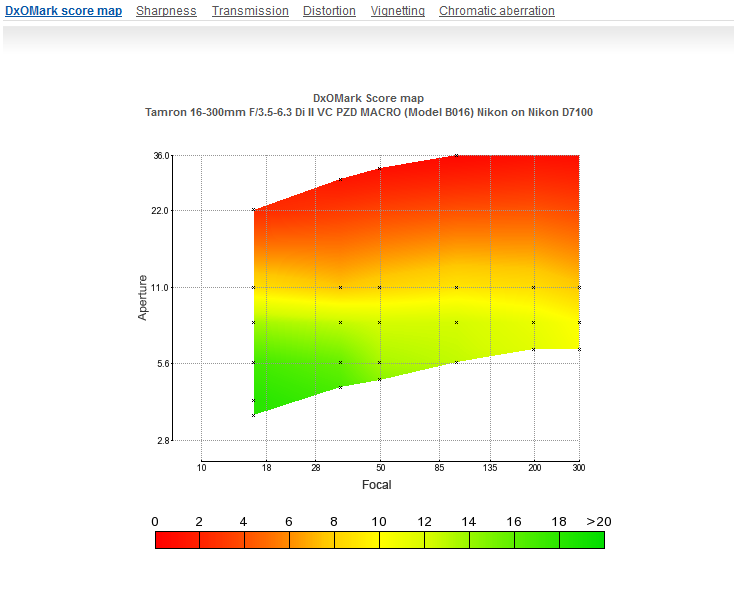 Closer examination of the DxOMark Score Map identifies that the Tamron 16-300mm f/3.5-6.3 Di II VC PZD Macro’s areas of overall strength are between focal lengths 16 – 300mm using wider apertures of f/3.5 – f/8, as indicated by the green/yellow areas on the map. 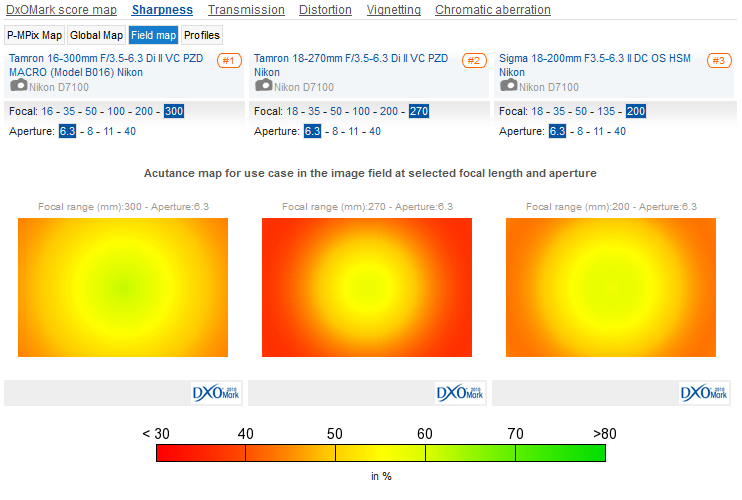 Stop down the aperture to f/11 or smaller, however, and overall performance drops off quite quickly, as shown by the orange/red areas. This is fairly encouraging, as due to the shutter speed issue mentioned previously, the performance of superzooms like this using the wider maximum apertures is going to be more important to many photographers than the smaller minimum apertures. 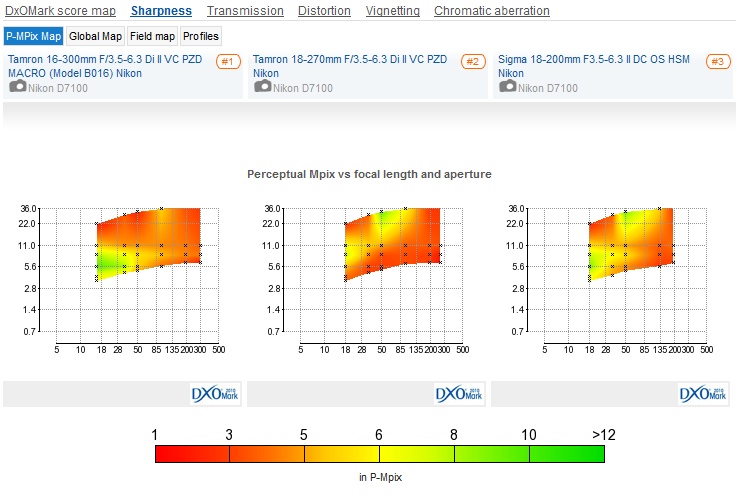 Drill down into the Sharpness P-MPix Field Map, however, and the results are not quite as promising. Again the areas of green show where the lens resolves the best sharpness, which is now limited to focal lengths 16-35mm and apertures of f/4 – f/5.6. If these are the settings you tend to shoot most with, but would like the convenience of shooting longer focal lengths occasionally without changing lens, then the Tamron 16-300mm f/3.5-6.3 Di II VC PZD Macro could suit you well. If on the other hand you’re looking for a telephoto zoom and want to shoot a lot at the longer 300mm end of the zoom, you might be disappointed with sharpness, which is in the red for all aperture settings. 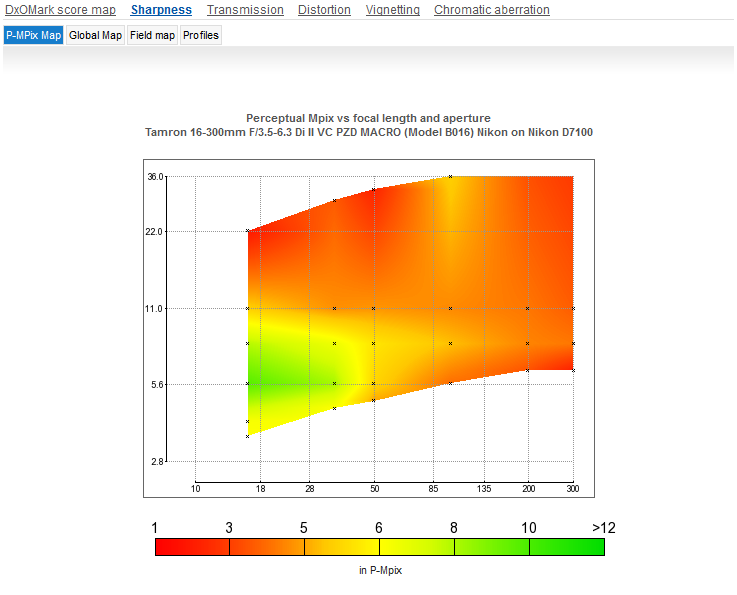 Of course results are all relative, so we need to pit the Tamron 16-300mm f/3.5-6.3 Di II VC PZD Macro against the other options available for a fair analysis. 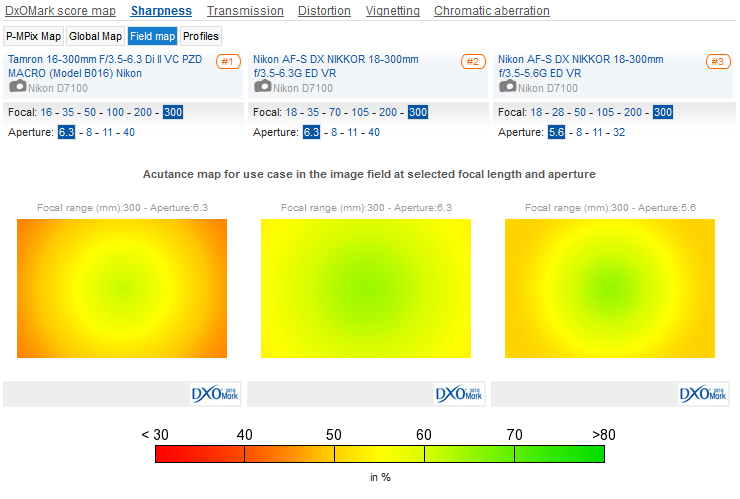 Nikon has two versions of its own DX superzoom available in the form of the $897 Nikon AF-S DX 18-300mm f/3.5-6.3G ED VR and the $997 Nikon AF-S DX 18-300mm f/3.5-5.6G ED VR. Those paying close attention will have noticed that these two Nikon alternatives are almost identical, with the exception of the maximum aperture, with the more expensive f/5.6 version letting in around 1/3rd of a stop more light at the longest 300mm focal length. At 18mm, the Nikon versions don’t offer quite the same view at the wide end of the zoom compared to the Tamron version, but other than that, they are similar propositions that include Nikon’s AF-S autofocus motor and Vibration Reduction (VR) technology to reduce camera shake. 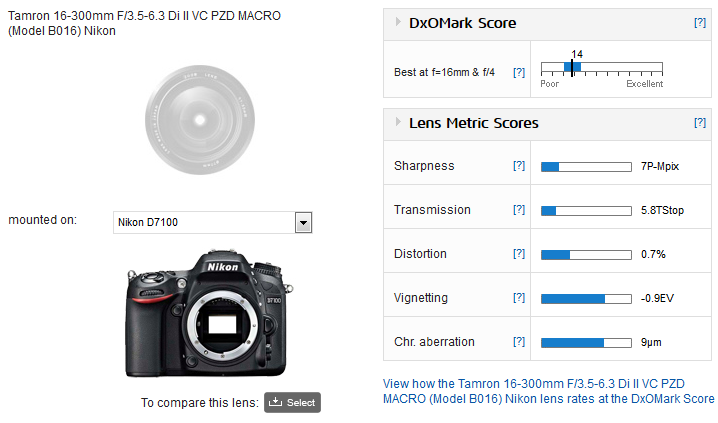 Again tested on the Nikon D7100, both Nikon versions offer a slight improvement compared to the Tamron’s DxOMark Lens Score of 14, with a score of 15 for the f/5.6 and 16 for the cheaper f/6.3 variant. 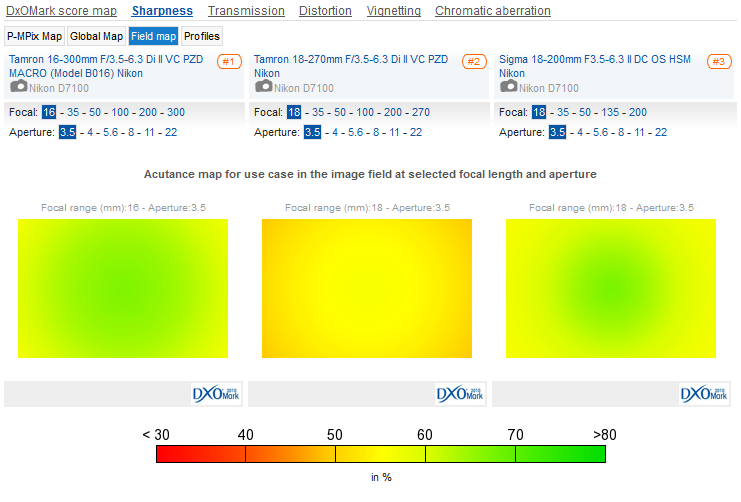 Characteristics and results in the sub-scores are fairly similar, too, with results towards the lower end of the performance spectrum for Sharpness, Transmission, and Distortion, but a strong showing for Vignetting. There is a more noticeable difference between the lenses for Chromatic Aberration, where Nikon’s more expensive f/5.6 version puts in a rather disappointing performance, with fringing often needing to be corrected in post-production. Which lens is going to be the best for you will be determined by the type of photography, and therefore settings, you intend to predominantly shoot with. 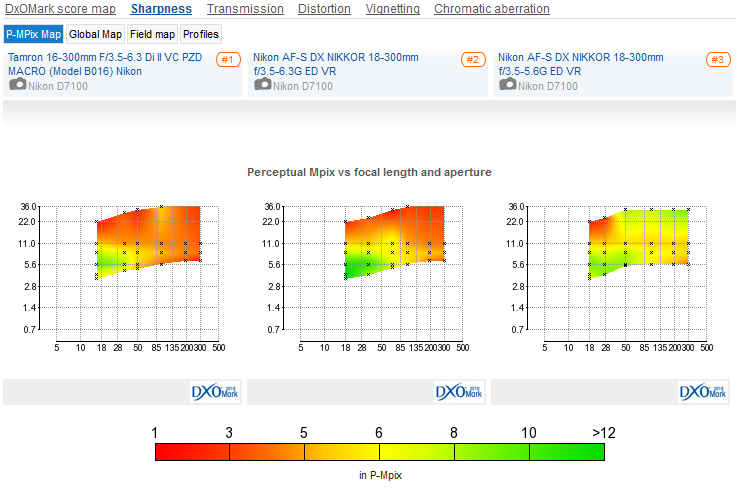 Despite the same overall sharpness score of 9P-Mpix for both Nikon options, there’s a variation in their strengths and weaknesses, as indicated by the maps below. While the cheaper f/6.3 is very strong towards the wide-angle, using larger apertures, the more expensive f/5.6 version puts in a more consistent performance across the board for sharpness. 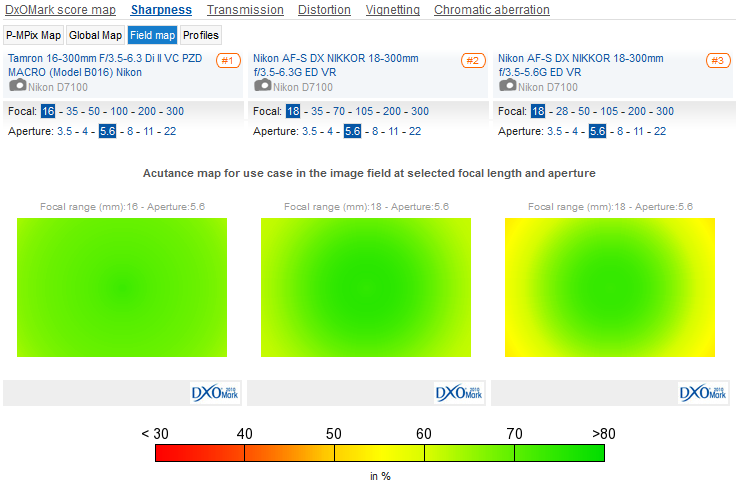 Towards the longer end of the focal range between 125-300mm, Nikon’s f/5.6 version manages better sharpness, as indicated by the yellows and green, compared to the dark oranges and red of both the Tamron and Nikon f/6.3 version at these focal lengths. Drill down even further and the field maps at f/5.6 or f/6.3 at the widest and longest focal lengths chalk up some interesting differences. For sharpness, the Tamron and cheaper Nikon f/6.3 version certainly excel at the wider 16m or 18mm end of the zoom, where they offer good and homogenous sharpness compared to the Nikon f/5.6 version, which gets soft towards the edges. While none of the lenses can offer homogenous sharpness at 300mm, Nikon’s cheaper f/6.3 comes closest, with sharper edges compared to the other two, although the more expensive Nikon f/5.6 version resolves the best of the three in the center of the frame. If a DX superzoom such as these appeals but you’re after something a little cheaper, there are a couple of alternative third-party options available from both Tamron and Sigma. The $449 Tamron 18-270mm f/3.5-6.3 Di II VC PZD offers a very similar feature set, but with a slightly shorter focal length that doesn’t offer as much versatility at either end of the focal range. Similarly, Sigma’s $299 18-200mm f/3.5-6.3 II DC OS HSM also boasts an autofocus motor and image stabilization at a much lower price, but zooms in only to 200mm at the long end of the zoom. 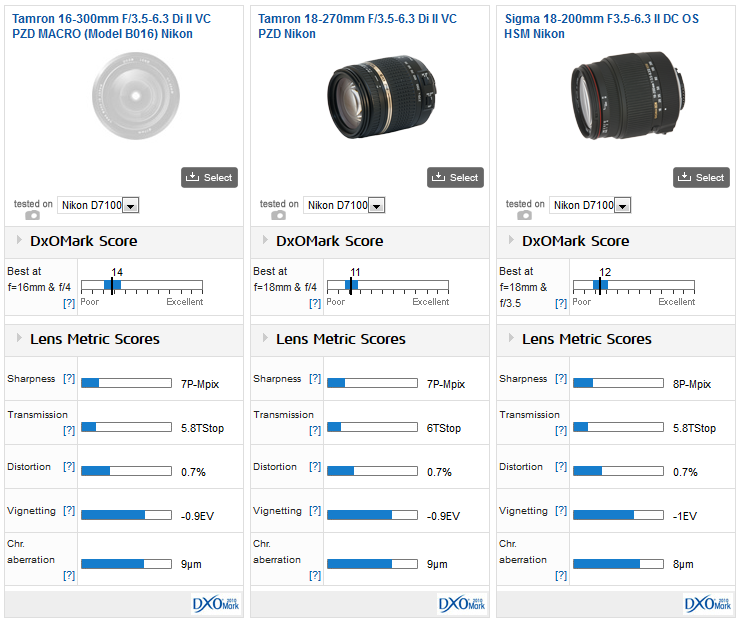 Against these cheaper options, however, the latest $629 16-300mm Tamron fares better, with its overall DxOMark Lens Score of 14 outclassing a score of 12 for the Sigma 18-200mm and just 11 for the Tamron 18-270mm. Again, there’s some variation in sharpness across the three lenses, but the Tamron 16-300mm f/3.5-6.3 Di II VC puts in a more consistent performance, offering better and more homogenous sharpness at a range of apertures at the wide end of the zoom. At each lens’s maximum focal length of either 200mm or 300mm, neither lens can offer homogenous sharpness, but the more expensive Tamron comes the closest, with less-pronounced sharpness drop-off compared to the other two. If you’re after a versatile all-in-one superzoom Nikon DX lens, the new Tamron 16-300mm f/3.5-6.3 Di II VC puts in a pretty solid performance. Covering such a long focal range in a relative small and light unit, a superzoom is never going to be the best-performing lens available, but that’s the price you pay for the convenience of an all-in-one. Packing in an autofocus motor and vibration reduction, though, you get a lot of lens for your money, and in terms of image quality, the new Tamron 16-300mm f/3.5-6.3 Di II VC holds its own against the competition. For an extra couple of hundred dollars, Nikon’s own 18-300mm f/3.5-6.3G ED VR version offers slightly improved sharpness, but there’s not much in it. If you want the best DX superzoom currently available, you’ll have to spend that little bit extra on the $997 Nikon 18-300mm f/3.5-5.6G ED VR version that offers a little more versatility with improved sharpness at longer focal lengths compared to the other two options, and a slightly faster maximum aperture, too.